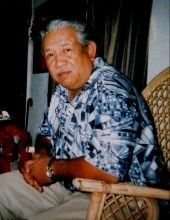 Daniel Longoria Sr., 73, was called to be with the Lord on April 13, 2019, with his family by his side. Born August 19, 1945 to Juan Longoria and Eusebia Josephine Lairon in Floresville TX, resided and met his loving wife Frances Longoria in Gonzales TX. Moved to Houston TX where he raised his family. Children: Carmen Longoria, Angie Salazar (son in law, Joe Angel Salazar), Daniel Frank Longoria, Jr., Celia Denise Longoria, adopted daughter Samantha Esparza and brother in law who he raised as a son, Raymond Cantu Jr. 13 grandchildren and 18 great grandchildren. Daniel was loved by many and will be dearly missed. To send flowers or a remembrance gift to the family of Daniel Longoria, Sr, please visit our Tribute Store. Guaranteed delivery before Daniel's visitation begins. Guaranteed delivery before Daniel's rosary begins. Guaranteed delivery before Daniel's funeral service begins. Guaranteed delivery before Daniel's burial begins. "Email Address" would like to share the life celebration of Daniel Longoria, Sr. Click on the "link" to go to share a favorite memory or leave a condolence message for the family.